MONDAAAAAY! Monday in the house. I’m actually super excited about it because, to be totally honest, I’ve been really looking forward to today: it marks the end of the busiest two weeks of my life. FO REALS. I’m not usually that person that’s like “OMG I’M SO BUSY” … but I’ve totally been that person. Normally I’m high-fiving whoever pins the “Stop the glorification of busy” pin. AMEN TO THAT! So while I hopefully haven’t been glorifying it, I’m glad the rush has kind of slowed down. WHY have I been so busy, you ask!? Nothing absolutely mindblowing/earth-shattering/bonkers. I told you guys I took five days in Southern Oregon for memorial day, which meant shorter work weeks before an after (crammmm! ), then I spent this weekend at Indulge Conference — a food blogging conference here in Portland, all the while trying to keep up a social life (like every day coffee or HH with someone. at least. ), and definitely NOT exercising enough. Oof. Am I complaining? I seriously am not meaning to complain. I’m just trying to wrap my head around how the heck I need to structure my life. The best solution I’ve come up with is that I need to be an early bird, which means being lame and end all social engagements at 10 pm. It really might happen. Let’s talk about this draaank. 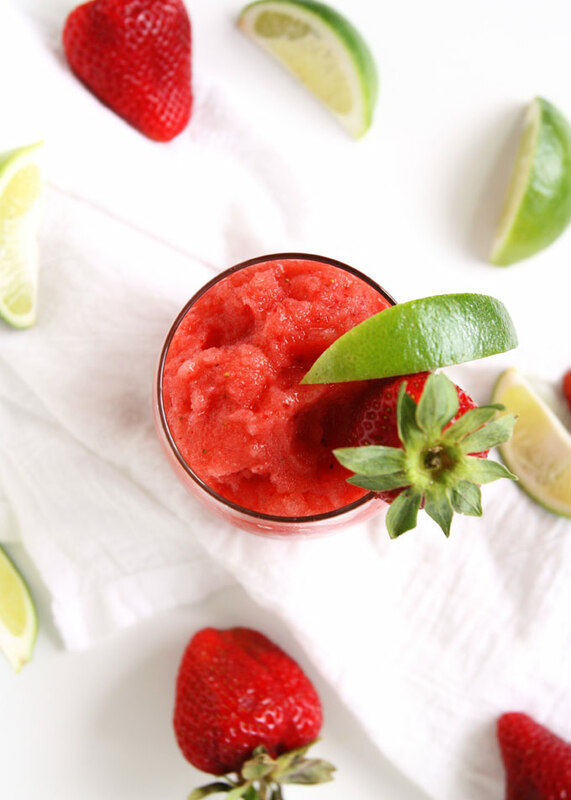 This is like go-to summer drink city: coconut water (frozen into cubes), a few strawberries, and a few juiced limes. Literally, that is it. THAT’S IT. So, healthy (fo reals), tasty (duh), easy (yep). THE BEST. 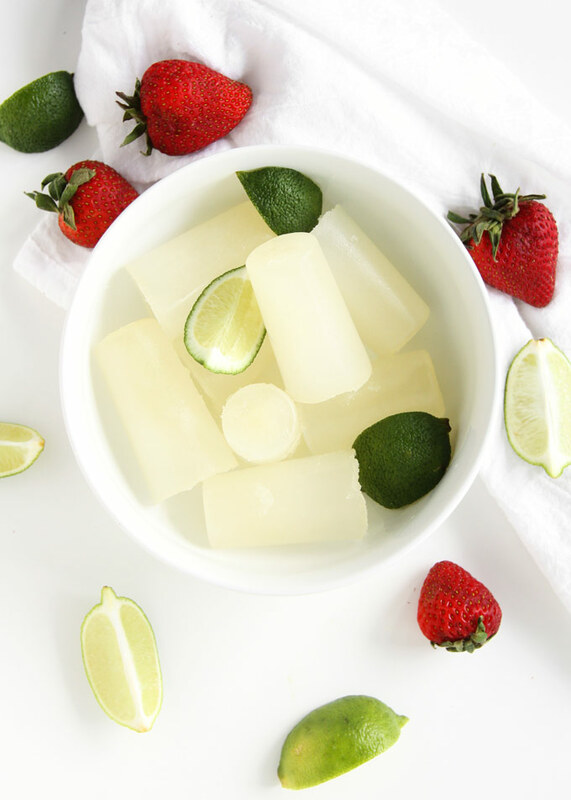 I don’t have ice cube trays (errr not #winning) so I used some popsicle molds to freeze my coconut water the night before, then just plopped them into my Vitamix along with some strawberries and fresh lime juice. MOST REFRESHING DRINK EVAAAA. Besides this one, maybe. Maybe they tie. If you haven’t gotten on the coconut water train: DOOOO IT! It’s so darn tasty, and super good for you. I’m 100% a fan. If I could drink 10 each day, I totally would. And then I’d be poor. Help me? Juuust kidding I’m gonna get a coconut tree and plant it in my living room. Duh. Solution = IN THE BAG. Just wear your helmet when you visit. Combine everything in your blender, and blend until smooth! You may need to poke it a bit to get it all blended — it will be pretty thick. Yes, please! I hear you on the busy thing. I don’t think we should glorify it AT ALL, but I always find myself busy and trying to find some downtime for my sanity! Sitting on the porch with a glass of this sounds like the perfect thing. 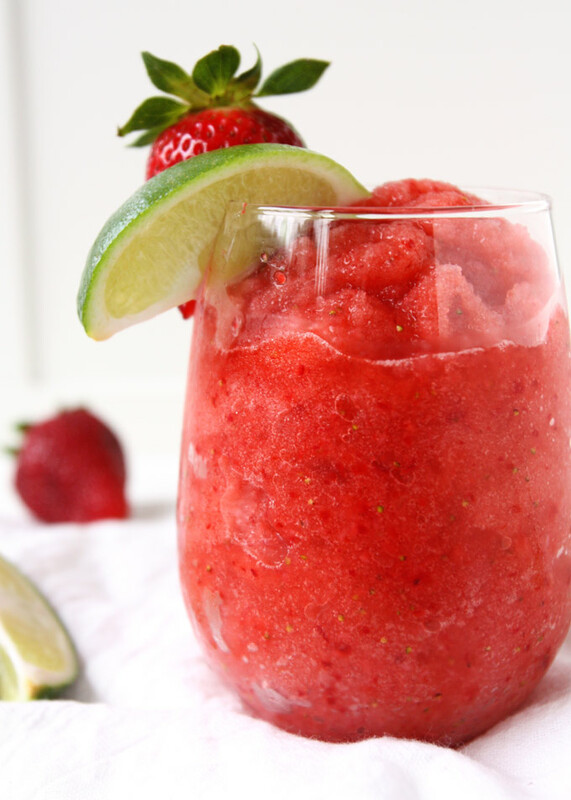 Oh my goodness this just looks so refreshing!! For how much we all want to do in our day, there surely isn’t enough hours. And then the crazy thing to think about is that we are one of the most overworked countries. A number of other countries, work less hours, take long breaks during the day. How do they do it? 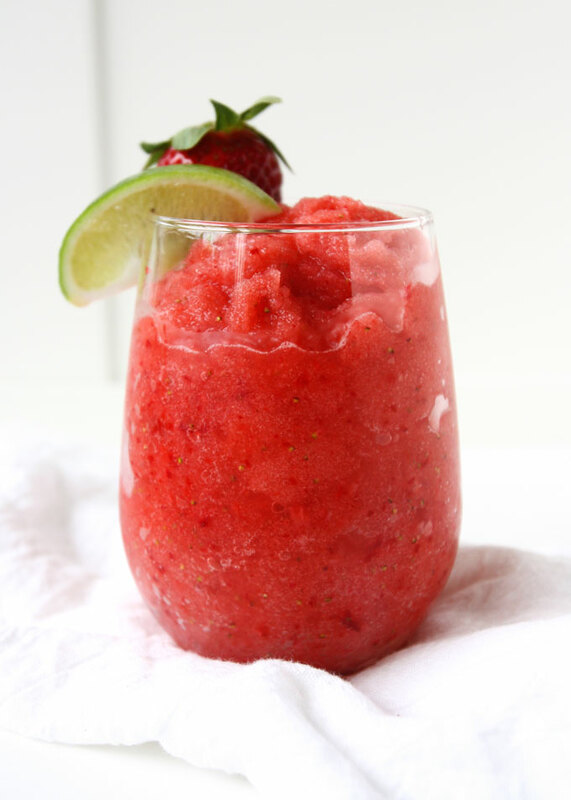 Okay, now I’m rambling 🙂 These slushies… ohhhh how I love a slushy especially in summer. And you’ve outdone yourself using my favorite flavors! Love it Mary!